Cost: $200 if registered before July 1. $250 afterwards. 6U Cost (6 and under): FREE! Welcome to our football family! Coming off of our first 2 League Championships in 2018, it’s an exciting time to be a Coyote! Emphasis is placed on teaching safe fundamentals, teamwork, sportsmanship and having fun. 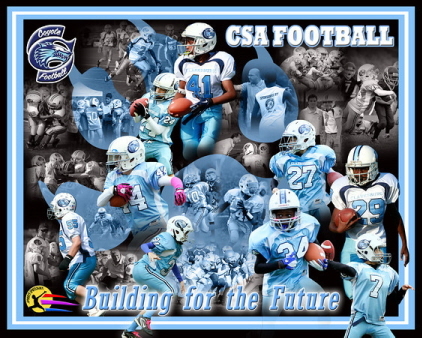 CSA participates in the Carroll County Youth Football and Cheerleading League, a highly regarded organization featuring play for 8 different age groups. CSA anticipates fielding at least 7 teams across the age groups. Formation of a 7U team depends on our registration numbers. Should we not have a team at that level, players will join the 8U team as they have always done in the past. If any groups over 8U have over 30 players, a second team will be placed into a separate league. We target approximately 20 players per team, and need a minimum of 15 players per age group. Should you have any questions that aren’t answered in our FAQ section, please feel free to contact Dan Bonner: ootball@clarksburgsportsassocation.org.